The sun was bright this morning and the sky blue. We ate breakfast in the hotel, then walked to the cathedral. They were having a market all around the cathedral. There were vendors selling all kinds of fruit and vegetables, meats, crafts, flowers with a large crowd of admirers and purchasers. It was exciting to see. We learned that mass would start very soon so we decided to attend and experience the beautiful interior again. As we entered the Cathedral, we had to pass through a beautiful porch which is at the base of the tower. It had an abundance of impressive art, which included about 418's stone figures, some of them free standing sculptures and others in relief, scattered across the walls. The three part tympanum above the door describes the Nativity, the Passion and the Last Judgment. All of the figures in the tympanum are painted with brilliant colors. The narrative begins at the bottom right with Angels appearing to shepherds and the Nativity. Next Jesus is taken prisoner and scourged, and then the traitor Judas hangs from a tree having taken his own life. On the extreme right and left, two trumpeting Angels summons the world to Judgment Day. The row of figures above represents the dead returning to life as they climb from their tombs. In the middle section Mary and John lead those who have been chosen for God's kingdom towards the crucified Christ, while Devils drag the damned into hell on a chain. These are among ma ny of the scenes depicted. Entering the nave one is struck by a rather mystical illumination. It is the combined effect of dark red sandstone and colorful stained-glass windows which admit little daylight. The nave consists of a wide high central aisle and two lower side aisles among the dominant features of the nave are its sweeping pointed arch arcade held up by strong clustered piers . There are no triforium. Walls on the side aisles are covered with monumental pointed arch windows. The Freiburg Minster is one of the few German churches which has retained most of its medieval stained-glass it dates from the 13th to the 16th century. Most of the windows are originals, although many of the fragments were reworked, altered or replaced in the 19th and early 20th century.The altar was on a platform at the crossing. All of the nave piers were adorned with statues. There are far too many beautiful works of art to describe here. We did stay for the Mass. We hated to leave this beautiful structure, but it was time to move on. We found a bookstore where we got a large poster, a small sketch, a book and a model. SEE MY MODEL Then off to Basel. We ran into construction with big delays - almost an hour. 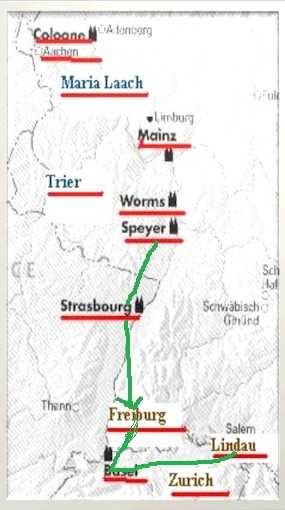 Without our GPS we would never have made it into Basel and the munster (cathedral). We parked on the square in front of the munster. We don’t think we were supposed to park there but there not too many people around. We went inside and found books, cards and a model. We found a nice restaurant but they didn’t have an English menu and we couldn’t read the German so we left. We found another one where we had quiche Lorraine. We went back to the munster. It was “reformed” not catholic. BASEL CATHEDRAL - SWITZERLAND 1019. There is evidence of a Roman church in Basil as early as 1st c. BC. At the beginning of 9th century, a new cathedral was built. In 916 the Huns devastated Basel. There are some remains in crypt today. Excavations suggest tha t there were two earlier churches in the Ottonian period. A second cathedral was built in 1019. After a fire in 1085 the west front acquired a north tower. In the last third of the 12th century, a late Romanesque-early Gothic structure to match original ground plan was built. Another fire in 1258 destroyed part of church. Again there was another restoration which was completed in 1285. In 1356 an earthquake wrecked the cappings on four corner towers and caused the collapse of the tower of the crossing, the choir and other vaultings. By 1362 the restoration was completed. There were further restorations in 1597 and 1701 off and on until 1787. Between 1880 an d 1890 there was extensive renewal of exterior. We left for Lindau, on Lake Constance. It was a long ride, over two hours. We got our first glimpse of the Alps around San Gallen. We found our hotel in Lindau – Lindauer Hof, but had to dri ve down some very narrow streets and park near a side door. The hotel was very nice and next to the shore of Lake Constance – the Bodensee. We had what was called a junior suite. We faced the lake and mountains…a wonderful view. We had a large room with a sitting area. There a second floor with a sitting room; but we didn't use this second floor. We also had a private terrace, but you had to go through the bathroom to get outside -rather strange . I had to go several blocks to park the car in a public parking lot. We went to a nice restaurant and ate outside. My wife had Spinatspatzle and I had a filet steak. Both were excellent. We walked around the island before going home. My wife said she thought she had died and gone to heaven it was so beautiful….. sea, snow-covered alp’s, charming town and old buildings and women in dirndls.